Member is a key aspect that Invest Plus takes into consideration as all calculations are done within that boundary. Changing respective members is also very easy. 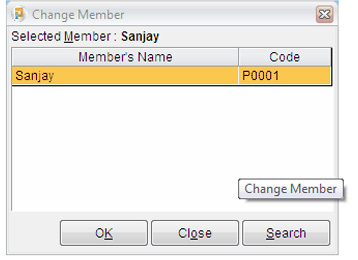 For changing member just click on change member form. You will get a message “Close all other windows before going ahead” Means you will have to save all the information of the existing member on which you are working before selecting a new member, if not saved you will loose all the information of the existing member. Select particular member then click ok button, now you will be working in the domain of the newly selected member, and now all the changes and all the data entry will be saved in the currently selected member account.